LUWEERO – Information reaching this website indicates that the Aruu County Member of Parliament Odonga Otto is hospitalised at Bishop Ceaser Asili Hospital in Luweero district following a fatal motor accident. This website has also learnt that MP Otto was rushed to Bishop Ceaser Asili Hospital complaining of pain in the legs and chest after being involved in an accident at Katuugo trading center in Nakasongola district along Kampala-Gulu Highway around on Friday morning. MP Otto’s car registration number UBA 832S reportedly rammed into a stationery lorry which had overturned in the middle of the road. The injured MP has been taken to Bishop Asili Medical Facility in Luweero for immediate attention. He is likely to be transferred to Kampala for more treatment later today. Otto was heading to capital Kampala city from Gulu when he crashed. Mable Asingwire, the Savannah Region Traffic Officer declined to comment, saying they were still removing the wreckage of both vehicles from the road to pave way for traffic. Police authorities on social media said the MP was first rushed to Bishop Ceaser Asili hospital in Luweero and he is currently being brought to Kampala for further medical attention. Meanwhile, a taxi, registration number UAR 161E over tuned at the new Nile Bridge in Jinja Thursday night. According to reports, the taxi was traveling from Jinja town to Mbikko when it overturned at the lips on the new bridge. 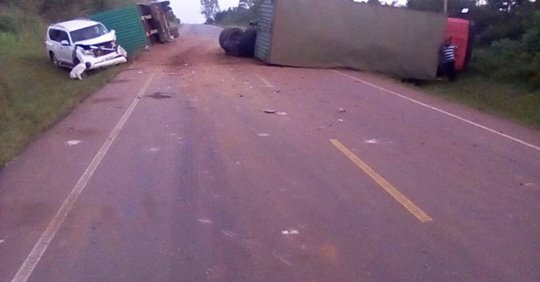 According to police authorities in Jinja, the vehicle had only one occupant, who escaped with minor injuries. “It was not on the bridge specifically, and had only one person inside who happens to be the driver,” a police officer on duty said. “We have not yet inspected the vehicle to ascertain the cause of the accident,” he added.